By May 2021 the safety requirements on collaborative robot systems in accordance with ISO 10218-1 and ISO 10218-2 must have been revised. Pilz contributes actively to the revision of the robot safety standards. The safety requirements on collaborative robot systems in accordance with ISO 10218-1 and ISO 10218-2 have not yet been described comprehensively. The safety requirements have been developed further as part of the Technical Specification ISO/TS 15066. These contents are partly included in the revision of the two standards and/or they are supplemented there. By May 2021 we expect a new version of ISO 10218-1 and ISO 10218-2 . Pilz is a member in the international technical committee ISO/TC 299 "Robotics", workgroup WG 3 "Industrial safety". 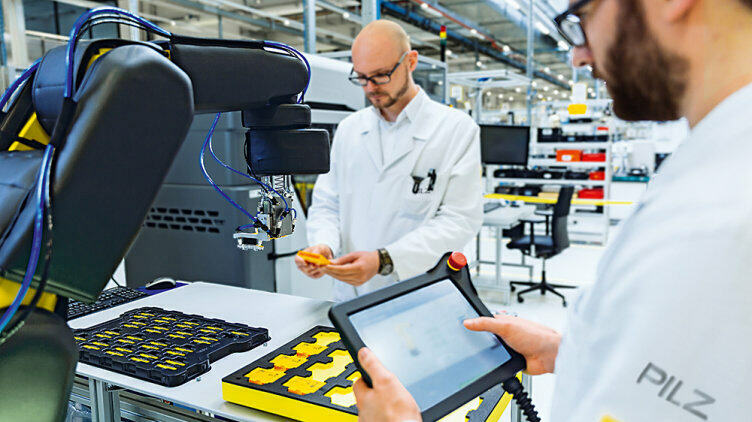 Together with several members, Pilz works actively on the revision of the robotics safety standards. In the beginning of June 2018, the technical committee met in Kyoto (Japan) for a work meeting. The ISO 10218 is the central safety standard for industrial robots. It consists of two parts: The ISO 10218-1 describes the safety requirements for the robot manufacturer. The ISO 10218-2 describes the safety requirements for the robot integrator.